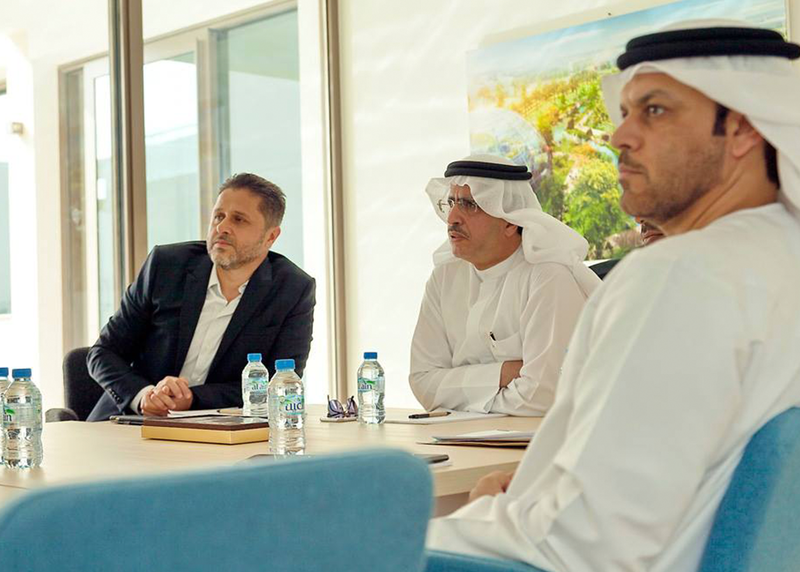 HE Saeed Mohammed Al Tayer, MD & CEO of Dubai Electricity and Water Authority (DEWA), visited Dubai Sustainable City, to learn about several of the city’s projects. Dubai Sustainable City is the first real estate project in Dubai that focuses on the economic, environmental and social aspects of sustainability. The city features a host of initiatives to conserve resources, including energy-efficient housing designs and eco-friendly building materials. During his visit, Al Tayer was accompanied by Dr Yousef Al Akraf, Executive Vice President of Business Support and Human Resources at DEWA, and Ahmed Abdullah, Senior Manager of External Communications. Al Tayer looked at different residential villas at the project, toured the city, and explored the barjeels, which have been built among each of the five communities in the city. Al Tayer also viewed the farm that was built as part of the project to grow fruits and vegetables, meeting the needs of the city. Al Tayer was also shown the 11 biodomes that were built to produce herbs, as well as sports facilities across the city, including football and basketball courts, a horse race track, a bicycle track, a running track, and other sport facilities as well as electric vehicle charging stations. “DEWA supports the long-term national Green Economy for Sustainable Development initiative, launched by HH Sheikh Mohammed bin Rashid Al Maktoum, Vice President and Prime Minister of the UAE and Ruler of Dubai, to build a green economy in the UAE. DEWA’s vision is to ensure the Emirate’s continuous growth and, at the same time, protect its natural resources and shape the future of energy in the region as a whole, to achieve sustainable development and promote the welfare of citizens, residents, and visitors, and ensure a sustainable future for generations to come. Dubai Sustainable City enhances Dubai’s international position, making it a global pioneer for sustainability, competitiveness, and green economy,” said Al Tayer. Al Tayer commended the city on its projects, which support DEWA’s vision by distributing electric vehicle charging stations among the city’s parking facilities. Al Tayer noted that DEWA has started installing and managing the required infrastructure to power electric vehicles, as part of its EV Green Charger initiative. This supports the Smart Dubai initiative, launched by HH Sheikh Mohammed bin Rashid Al Maktoum, to transform Dubai in the smartest city in the world. DEWA recognises that more and more people are attracted to the concept of using a cost-efficient, clean car that preserves a clean and sustainable environment. DEWA installs and manages the required infrastructure to supply cars with electric power, to decrease air pollution and preserve the environment. Al Tayer also noted that DEWA has developed a comprehensive Smart Grid strategy and aligned its corporate strategy with the Smart Dubai initiative. DEWA is currently implementing three major initiatives: Shams Dubai, smart applications and smart meters, and Green Charger. The Green Charger initiative substantially contributes to introducing electric vehicles to Dubai, boosting the use of energy resources and reducing the Emirate’s carbon footprint. “We are honoured by HE Saeed Mohammed Al Tayer’s visit to Dubai Sustainable City. The visit proved fruitful for both sides as we discussed enhancing relations and exchanging best practices and experiences in regard to smart and green cities and the reduction of carbon emissions. Dubai Sustainable City has created a platform by which Dubai’s real estate sustainability standard can be applied. These standards were created by Dubai Land Department and Dubai Municipality. The new city reflects the private sector’s commitment to carrying out the directives of the UAE, and of Dubai in particular, to support the UAE’s Green Growth Strategy,” said Faris Saeed, CEO and Co-Founder of Diamond Developers. Dubai Sustainable City is the region’s first fully-integrated sustainable community. Every aspect of the development has been designed to economically benefit residents, from its revenue-sharing schemes, and net zero service fees, to its wealth of employment opportunities. The Sustainable City places a priority on nature, green spaces, health, education and recreational activities, with an emphasis on nurturing a sustainable lifestyle that is allied to a strong sense of community. It spreads over five million square feet, and is located in Dubai Land on the Al Qudra Road.